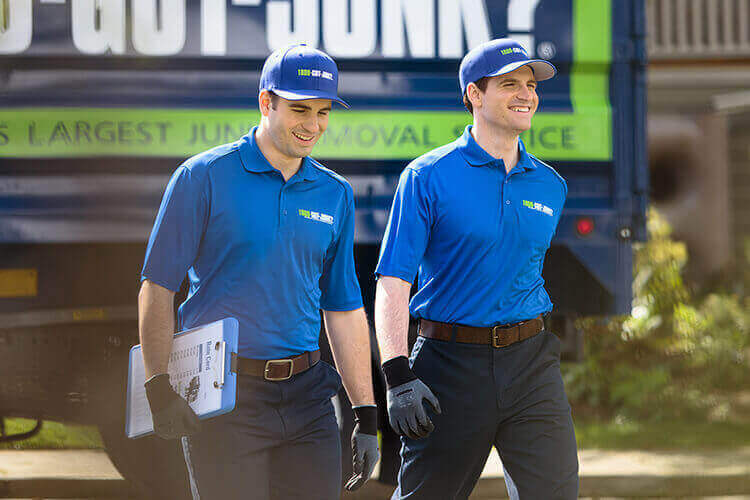 Furniture Removal; Pick Up & Recycling | 1800-GOT-JUNK? Getting rid of furniture certainly isn’t an easy process. It's heavy, it's awkward, it's hard to maneuver, and it’s nearly impossible to do on your own. Even if you live in a place that offers furniture collection services, you’ll still need to convince someone to help you with the heavy lifting. Otherwise, you’ll have to drop it off for donation or at the dump on your own. 1. Simply schedule your furniture removal appointment online or by calling 1-800-468-5865. 3. When we arrive, just point to the furniture you want removed and we’ll provide you with an up-front, all-inclusive price. 4. Once you say the word, we’ll haul your furniture away from wherever it’s located and finish by cleaning up the area. Plus, we recycle and donate your furniture whenever possible. 1800-GOT-JUNK? will take care of it for you! It might just be the easiest decision you’ll ever make. We’ll grab those heavy items out of your home or office, load them onto our truck, and ensure that it gets donated or recycled whenever possible. We’ll take care of those heavy & cumbersome furniture pieces out of your home or office, pack them onto our truck, and most importantly, do our best to ensure that it gets donated or recycled whenever possible. Can You Throw an Old Couch in a Dumpster? Couches are difficult to get rid of, so it might be tempting to simply throw them out by leaving them near or in a dumpster. The problem with doing so is that many rubbish pick up services aren’t equipped to handle couch removal. In order to pick up an old couch, it often needs to be broken down before it can be removed. However, there’s a more important reason why you shouldn’t just throw your couch in the dumpster; most of its components can be recycled. When you take the time to properly dispose of your old couch, nearly all wood and metal components can be reclaimed and recycled. There’s also an opportunity to salvage the foam, cardboard and textile components for reuse or recycling as well. Furniture recycling isn’t always easy to handle on your own, since it means you will need to find an appropriate facility and take care of transporting it there on your own, which can be difficult. If you need to get rid of an old couch and don't want to take care of it on your own, you can always call 1-800-GOT-JUNK?. We’re couch disposal experts and will take care of all the heavy lifting for you. We’ll pick up your sofa right from where it is, load it in our truck, and then make sure it is donated or broken down for recycling. Can Wooden Furniture Be Recycled? Wood furniture presents unique problem when it comes to recycling. Most furniture is made of treated wood, which means it has been pressure treated, stained, painted or varnished. This type of wood is very difficult to recycle, since the chemicals in the varnishes, paints, adhesives and other wood treatment products can’t be used for typical recycling by-products like mulch. This also includes materials like particleboard and chipboard. If you have items that are made from untreated wood, these can be recycled and sometimes even composted. The best thing to do with old treated wood furniture is find a way to reuse it. If you can’t find a way to reuse it on your own and just want it out of your way, you can always call 1-800-GOT-JUNK?. We’re furniture disposal experts! We’ll pick up your old wood furniture and ensure it gets donated or disposed of responsibly. We work hard to keep items out of the landfill, so you can rest easy knowing that we will take care of it the right way. What are the benefits of recycling furniture? When you simply throw furniture in the rubbish, there’s an immediate environmental impact. If furniture is made of treated wood, the harmful chemicals used in the treatment process could contaminate soil and water in the areas surrounding it. It could also be made of other materials that simply don’t break down naturally and will therefore sit in landfills for years. One of the best ways to ensure that your furniture is properly disposed of is to let 1-800-GOT-JUNK? Haul away your old furniture pick up for you. Not only will we take care of all the heavy lifting and transportation for you, but we’ll also make sure it gets donated, recycled, or disposed of properly. It’s an easy way to go green!